Open Daily from 10am to 5pm. 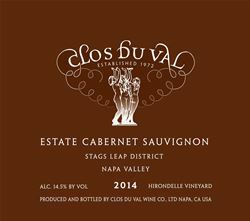 In 1972, Clos Du Val acquired 150 acres of estate vineyards in the heart of the Stags Leap District, and made its first wines, including Clos Du Val’s legendary debut 1972 Cabernet Sauvignon—one of only six California Cabernets selected for the famous 1976 Judgment of Paris Tasting. Today, Clos Du Val’s acclaimed estate program has evolved to include vineyards in Carneros and Yountville. From this diverse palette of estate fruit, which includes 30 distinct blocks of Cabernet Sauvignon, Clos Du Val makes a small portfolio of estate-grown wines, with an emphasis on the exceptional Stags Leap District Cabernet Sauvignons that first catapulted Clos Du Val to fame. Grown by master Winegrower Jon-Mark Chappellet, and made by renowned Winemaker Ted Henry, Clos Du Val’s wines are recognized for their balance, complexity and vivid fruit. Experience the beauty of our estate—distinctly Clos Du Val, quintessentially Napa Valley. Nestled within the majesty of the Stags Leap District, we invite you to visit our picturesque estate. Inspired by the iconic Three Graces—Joy, Mirth, and Splendor—that have adorned our label since 1972, we offer a warm and intimate tasting experience where good friends can gather to explore great wines. From the grace and grandeur of our renowned Cabernet Sauvignons to the vibrant allure of our estate-grown Pinot Noirs and Chardonnays, your wines await! For reservations, please contact us at hospitality@closduval.com, or 707.261.5212 to reserve your visit. From the grace and grandeur of our renowned Cabernet Sauvignons to the vibrant allure of our estate-grown Pinot Noirs and Chardonnays, our picturesque estate offers an inviting setting for exploring our wines. We currently offer three different by-appointment tasting experiences showcasing select current releases and special bottlings only available through our winery. Wine clubs are a great way to stay connected to your favorite wineries. To join the wine club, visit www.closduval.com or call 707-261-5200. Clos Du Val’s greatest treasures are reserved for members of our Coterie. Join a circle of like-minded connoisseurs for insider access to the exceptional wines and experiences that are uniquely Clos Du Val. Each season receive our winemaker’s selection of estate grown bottlings at preferred pricing, including our flagship Stags Leap District Cabernet Sauvignon and others produced in quantities so small, they’re only available at the winery. The offer listed below is valid for all Napa Valley residents age 21 and over. Complimentary tasting reservation for Napa Neighbor and one guest. Available Monday through Thursday, reservations recommended. Clos Du Val is certified under the Napa Green Winery Program by the Napa County Department of Environmental Management (DEM) and the Association of Bay Area Government’s (ABAG) Green Business Program and completed all the regulatory components needed for environmental sustainability. These components included developing water and energy conservation methods, preventing pollution, and reducing solid waste. In addition to developing sustainable winery practices, this program is set to become the standard for the state of California. Clos Du Val is certified under the Napa Green Certified Land Program. Clos Du Val has created and implemented a customized farm plan with measured results that addressed all aspects of its property, vineyard land as well as non-farmed land, including practicing soil conservation, water conservation, stable drainage, riparian corridor enhancement, fisheries and wildlife habitat enhancement and long-term improvement and sustainability. Once a year the rarest new Napa Valley wines become available under one roof at Premiere Napa Valley. Wineries throughout the Napa Valley are given one task to participate: create a one-of-a-kind wine for this event to be purchased by one lucky bidder. This event is only open to select members of the wine trade and the successful bidder is the sole owner of this unique wine. Adopt-a-School is a cooperative effort by businesses, industry and government to stimulate support of education and public school students.